As per Technavio, the use of predictive biomarkers for the development of cost-effective therapies will have a positive impact on the market and contribute to its growth significantly over the forecast period. This global non-small cell lung cancer drugs market 2019-2023research report also analyzes other important trends and market drivers that will affect market growth over 2019-2023. 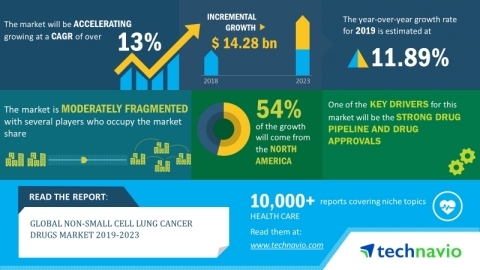 More From BioPortfolio on "Global Non-Small Cell Lung Cancer Drugs Market 2019-2023 | 13% CAGR Projection Over the Next Five Years | Technavio"